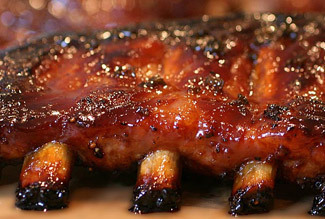 Hot & spicy barbecue sauces are great for those who can tolerate the onions and peppers. But there are a lot of people who can't, and that's why I made Hack's, a thick and rich, tomato based, specialty sauce. Hi. My name is Stephen Dodd and I created Hack's BBQ Sauce in 1999 for my wife who was forced to eliminate onions and peppers from her diet for medical reasons. Here's the complete story. Our family and friends have been enjoying this specialty barbecue sauce for over 10 years. Now it's available for you! Try a bottle. I think you'll enjoy the thick sweet & tangy taste of Hack's BBQ Sauce even if you don't have dietary restrictions. You'll be glad to know that Hack's BBQ Sauce is naturally Gluten-Free and is also MSG Free. Now you can enjoy grilling your favorite meats again! If you, or someone you know, has given up eating barbecue sauce because of an onion or pepper intolerance, then tell them about our sauce. Send them to our web site. Buy them a bottle for their birthday. They will love to start grilling again! It's great on barbecue ribs! And if you have questions or just want to let me know how much you like Hack's BBQ Sauce, then write me an email . I would be glad to hear from you. "Our family favorite for over 10 years."